This Unit is available for Rentals. The RNT-EPL-16BS-1X150LED-100 Explosion Proof LED Light from Larson Electronics is rated Class I Division 1-2 Groups C & D and Class II Division 1-2 and uses a 16 inch Cree LED light head to produce 17,500 lumens of light while drawing only 150 watts. The RNT-EPL-16BS-1X150LED-100 explosion proof LED light provides 10,000 square feet of work area coverage with 17,500 lumens of light output. 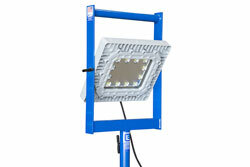 This portable LED light is mounted to a four leg aluminum base and has an LED light head measuring 16 inches wide by 14 inches tall. The LED light head on this unit produces a brilliant flood pattern of light that is ideal for illuminating enclosed areas and hazardous locations where flammable vapors, gases and dusts may be present. Often referred to as simply a “tank light,” this unit is considered universal due to its ability to be passed through any conventional manhole such as those found in petrochemical containers and ship storage tanks. The LED light head is offered in a 60° narrow flood for greater distance and a 125° wide flood that produces a brilliant flood pattern of light that is ideal for illuminating enclosed areas and further adds to this units desirability as a portable tank lighting solution. This explosion proof LED light fixture is comprised of a 16 inch LED light head mounted atop a base stand fabricated from non sparking aluminum. Transferring the unit through manholes consists of simply removing the light head from the base, passing the light head and base through the manhole separately, and then reassembling the unit once inside. The lamp can be easily adjusted up or down 90 degrees and locked into position by simply loosening the two hand screws located on either side of the light head and retightening them once the desired angle is found. 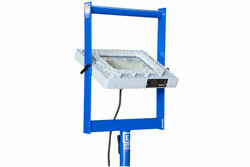 Included with this LED light cart is 100 feet of SOOW cord, which combined with the 360° of rotation and 90° of tilt offered by the LED light head provides an effective alternative to often cumbersome explosion proof string lights.